Mark Fisher disappeared from his home in a brilliant flash of blue light almost two years ago. His friend Seth Hampton was the last to see him alive. Now a string of grisly, violent murders leads Seth to believe that Mark is back, and something evil is inside of him. 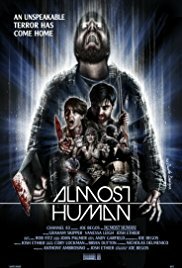 Are you a fan of the slasher genre and it shouldn’t be too complicated, then you’ll certainly appreciate ˝Almost Human˝. This extremely short movies of less than 80 minutes doesn’t waste time and starts immediately after a successful beginning and then goes on in a terrifying pace. 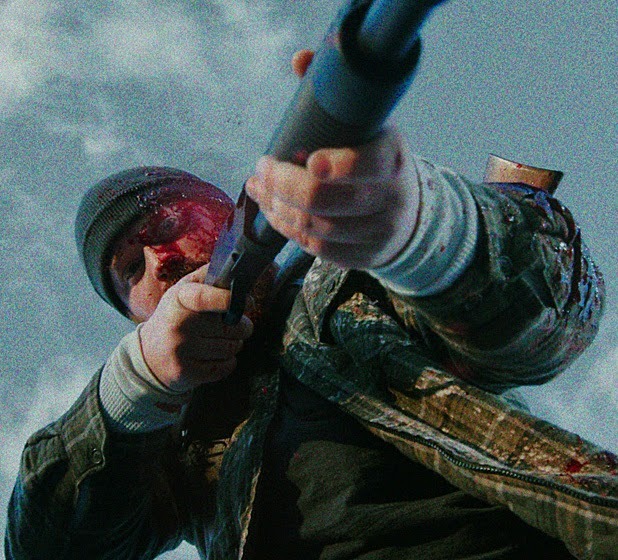 Where Joe Begos, writer, producer and director of this scifi-slasher, got his inspiration is obvious. He made an appeal on quite some acquaintances to act in this low budget movie. And eventually that´s the only downside. You can hardly call most of them acting talents. But I must admit that technically and script-wise it´s put together nicely. Patten, Maine, 13 October 1987. Seth (Graham Skipper) arrives with top speed at his good friend Mark´s (Josh Ethier) house and tells the unlikely story that their friend Rob disappeared into thin air after a blue gleam appeared and he got sucked into the sky. Mark doesn’t believe him until the same symptoms manifest themselves at his place : blue light and a deafening shrill sound. Before the eyes of Seth and Jen (Vanessa Leigh), Mark’s girlfriend, the latter disappears too. Two years pass and Seth is still suffering from this traumatic experience: nosebleeds, sleeplessness and endless visits to a therapist. He himself was arrested because the authorities thought he had something to do with the mysterious disappearance, but due to a lack of evidence, he was released. Jen went on with her life again and has an uncomplicated relation with someone else, until Seth shows up with the news that something is fishy, and he has a feeling Mark will return. The first thought that occurred to me when seeing the movie poster is that it´s kind of similar to that of ˝The Thing˝ and ˝Scanners˝. ˝Almost Human˝ is an homage to the VHS era of the 80’s. It’s a mix of B-slasher movies from that period as ˝Friday the 13th˝ and ˝Sorority House Massacre˝, and SF movies about alien abductions like ˝Invasion of the Body Snatchers˝ (especially the primal scream of Mark reminds me of that one) from years ago and recently ˝Dark Skies˝. You can therefore expect the inventive use of butcher knives, axes and chainsaws. Sometimes it’s rather simplistic. As Mark approaches someone carrying a shotgun while that person is working with a chainsaw, and you can also see a log with an axe in it, you don´t need to be smart to figure out how this will end. The bloody gore parts are abundant and the real horror fans will definitely be delighted. The more critical film lovers however will stumble over the sometimes abominably bad acting. The way Mark attempts to fertilize Jen was an original idea though. The two protagonists Graham Skipper and Josh Ethier were the most convincing. Especially Ethier delivered a brilliant performance. Skipper started in a promising way but gradually evolved into a wistful and baffled person who just could not grasp it all and constantly repeated that he didn’t really understood what was going on and that something wasn’t right. His facial expression was purely infantile at a certain moment. The rest of the cast was acting as if it was a privilege to take part in this movie and it was something to brag about during a game of bowling with some friends afterwards. Especially the colleagues of Jen and Seth were quite amateurish. On the one hand they looked as if they were afraid to forget their next sentence. And on the other hand they looked like a toddler who has done a pee for the first time on the potty : satisfied and proud. The reaction of Jens new fiance as Mark suddenly stands at his door is so stupid that it was justified to be slaughtered. The guy disappeared mysteriously and suddenly reappears after 2 years. I would react differently for sure. Besides the sometimes weak performances, there were also some flaws that I noticed. These are small details. But avoiding such errors benefits the credibility of a movie. There were two hunters who discover Mark in the woods. One of them wants to go and check it out, fearless because he holds a huge shotgun, and the other follows him while holding another rifle. But still he needed to load that riffle when they were attacked. Fairly stupid for an experienced hunter, I think. Then there was the moment that Mark drove off with the captured jeep at the gas station with a windshield smeared with gallons of blood. The next time we see him driving, you´ll notice a clean windshield as if he has just visited carwash. Yet ˝Almost Human˝ could charm me. A short, fast and furious SciFi horror with some gore excerpts. Allthough you can´t really call it exciting. The performances are sometimes lousy, but the editing of this movie is excellent. Not a moment I had the feeling I was watching a low-budget movie filmed with an ordinary digital camcorder. Joe Begos is definitely a name to keep in mind.